We all remember the Verizon Test Man and his seemingly endless quest to verify the company’s wireless network by asking an anonymous other-ender, “Can you hear me now?” Well, now that Verizon assuredly boasts that it has America’s most reliable network, the famous question has become less about wireless coverage, and more about smartphone microphones. If you remember a column earlier this year on the potential of MEMS microphones in the Internt of Things (IoT), you’ll recall a startup out of the University of Michigan called Vesper that was developing piezoelectric MEMS microphones with an innovative triangular cantilever architecture that made them highly resilient to dust, particulates, and water while also delivering a high-quality signal-to-noise ratio (SNR) of 68 dB. Fast forward a few months to the MEMS Executive Congress in Napa, CA, and Vesper is now in pilot production. 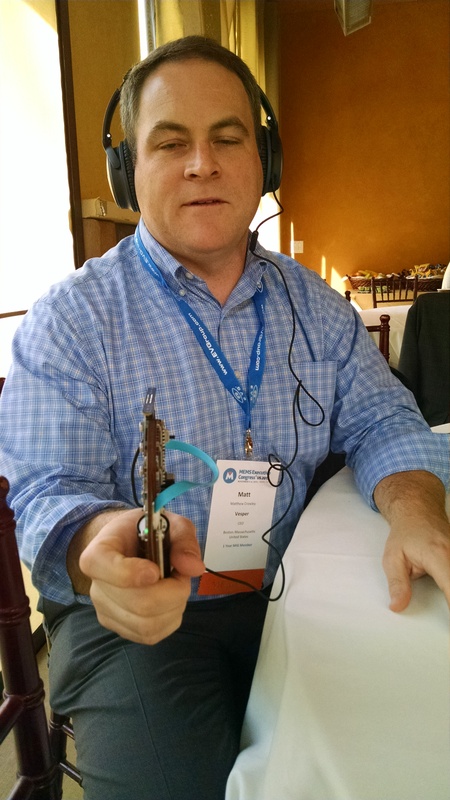 Sitting in the press room at the show, Vesper’s CEO Matt Crowley unpacked a curious mechanism, which at first glance looked like a cross between a ping pong paddle and a laser tag gun, but turned out to be a MEMS microphone array demo. Before I knew it I had on a pair of headphones and was holding the contraption equipped with four Vesper piezoelectric MEMS mics while Crowley explained that a full pull of the trigger would enable an audio zoom feature that helped isolate his voice from other ambient noise in the busy room, while a half pull put the system into interview mode, clearly amplifying his voice and my voice over the headphones by allocating two microphones in each direction. The quality was impressive, if not a little odd when we were both talking. Crowley and the team at Vesper are firm believers that ten year from now, voice will become the primary user interface for the Internet because of how natural speech is. Furthermore, he pointed out that while today’s smartphones are typically outfitted with four MEMS mics, the soon-to-be released Motorola Droid has five and certain development teams are toying with the idea of including eight on a single phone. The more mics, the higher quality, better precision, and longer range, and with eight microphones you’d be surpassing the performance of Amazon’s Echo platform, which is basically the equivalent of Siri for the smart home, currently outfitted with seven. Vesper will be shipping small volume quantities in Q1 2016. To learn more, visit vespermems.com.